In 2014 the Texel shipwreck revealed some incredible 1640s treasures including a gown belonging to a very wealthy woman. But for some the most exciting find was less grand. A pair of unworn silk stockings was found in the same pile of muddy rags that held the gown, an embroidered velvet purse and a Bible carrying the Stuart crest. The project has been opened up to enthusiasts through a series of workshops. “Naturally we cannot do this alone. And we don’t have to, for we hope many people will want to join this project. With the help of experienced knitters, we will make several pairs of stockings. Participants will benefit from this exciting project and so will we. During the process we will all learn about the now lost art of knitting silk stockings out of very fine silk threads and using exceptionally thin knitting needles. We will accomplish this project and knitting during a series of workshops held at the TRC Leiden. Then, when everyone feels confident participants will be able to do the knitting at home, with specially chosen needles and silk yarn that will be provided by the TRC Leiden,” it said. Workshop 1 on February 18 requires no knitting experience as the TRC’s Chrystel Bandenburgh and Lies van de Wege will give an introduction to the project and a demonstration of various knitting swatches. Participants will practice knitting silk using very thin needles while workshop 2 on March 10 – 11 will be a two-day workshop working in small groups on the art of forming the stocking. See more details here. The Texel wreck is thought to have been a medium to large well-armed merchant ship and researchers suspect that it was a three-mast vessel from the Golden Age. Due to the diversity and origin of the cargo it is possible that the ship departed from Amsterdam which served as a depot. The Kaap Skil museum says years of investigation will be necessary before it becomes clear what the origin and significance is of this clothing find with royal allure. 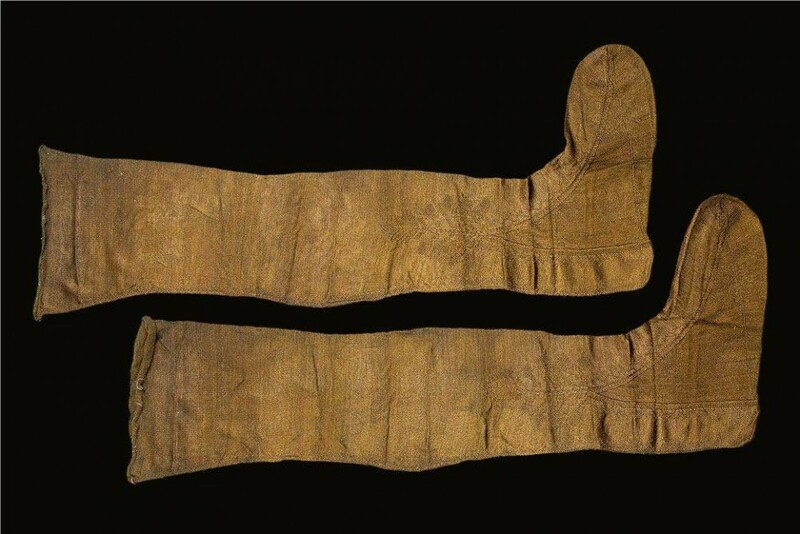 “At any rate, it is clear that it concerns a unique find worldwide; almost nowhere in the world has any clothing from the 17th century preserved,” it said. The gown is made from silk woven in damask and embroidered with a floral pattern. It is almost certain that the original gown was only one color. From the wide use of silk and the model, it is clear that this dress belonged to a woman from higher society. No silver or gold thread has been found in the dress, although it has been discovered in other textile in the find and so it is thought to have been made for more everyday wear.